The challenge: to visit all three Fuel Coffee locations in Seattle and eat at least one slice of their High Five Pies at each location. 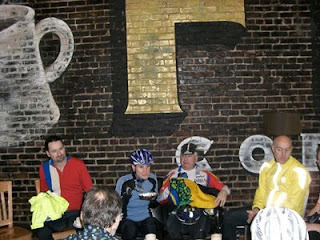 The participants: 18 pie-loving cyclists who like pie, aren't afraid to show it and aren't in a hurry. 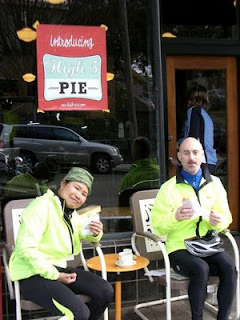 we were all excited about the challenge before us: to eat pie during three stops on a 24-mile city ride in Seattle. 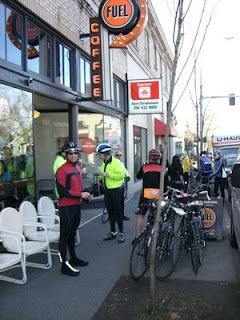 The challenge began with a hillclimb to our first stop: Wallingford Fuel on NE 45th St. One pair of riders lost their way but were soon found, just in time to help devour a whole apple pie. Others held cups of caffeine-laced drinks and shared space on a couch in the back, sitting beneath a mural of "Fuel Coffee" painted on a brick wall. The energy level was as high as the volume but, this being only our first stop, I hesitated to pronounce it a success. 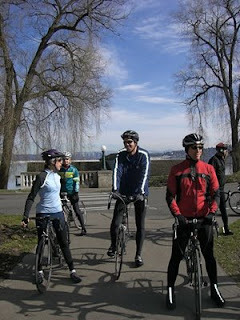 We departed Wallilngford and headed for Greenlake with barely a comment about the cold, even though we were essentially rolling downhill. That must be an effect of good pie- you forget all your troubles. We rode over the freeway and across the pedestrian/bike bridge toward the UW. The comments, "What city are we in?" and "this looks like a park" were commonly heard. We snaked around the stadium to the Montlake bridge and on to our second Fuel stop on 24th Ave. There at Montlake was where the challenge grew too large for a few of the group. 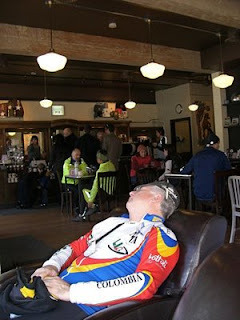 Biil, weekly leader of Goosebumps (and post-ride beer guzzle), collapsed in a leather chair and all that could be heard from him was "zzzzz...". A group from WAC (new COGS member Jenn and Quinn, Robin and Tobias) made an excuse about having to attend a bike swap. I am quite concerned about those folks, as I believe the saying, "love the one you're with" should also apply to your bicycle. But I tried to stay non-judgemental. the final pie stop. We had been tricked! I just hoped their favorite wasn't Cherry Crunch as the supply at each cafe had been alarmingly low. The next series of roads could have been subtitled, "Olmstead Legacy Tour", as we were riding up and along a series of boulevards and park drives. Lake Park, Mt Baker Boulevard and Cheasty Boulevard. What a treat! We made our way across Beacon Hill, taking in the magnificent views to the Olympics before descending down and across the Green Bridge to the convergence area of the ID, First Hill and Capitol Hill. We began to do some serious cruising...of the city kind. There were lots of stoplights to keep our speed down and lots of time for looking around. I mentioned to Michael that Lark was on my wishlist for restaurants and he assured me it was worthwhile, then added that we were about to pass one of his favorite places, Cafe Presse, where I had been for my birthday when Wayne filled us in on the best place in town for a Ban Mi (and Wayne is a member of the MSG 150 bloggers!). I was blissfully surrounded by foodies! 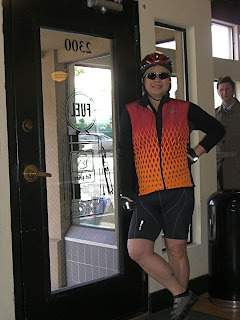 And so on we went, pointing out great restaurants and cafes until we arrived at our final Fuel Coffee stop on 19th Ave E when who should be standing outside, but Becky and Tom, pies in hand. They had cut and pasted the route and had arrived about 5 minutes before us; luckily for us, they didn't have the appetites or devious wills to buy the whole place out. One more round of eating, drinking and chatting and then we loaded our full bellies onto our bikes and headed down Interlaken Drive and to Gasworks. Stats: 25 miles, 3 slices of pie, 1 mocha, 5 hours. And go here for the full photos with description. Wow! I'm all over this one next year.